Is this the finest War Machine costume ever made? I wouldn't like to be a cosplayer right now, not having seen this amazing War Machine costume created by cosplayer Anthony Le. 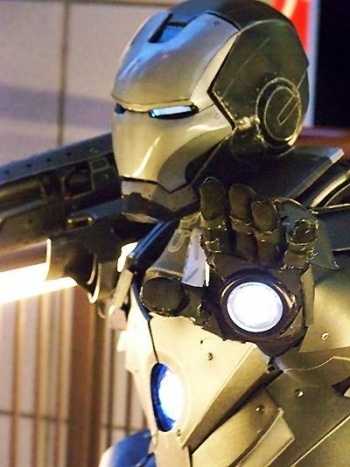 The armor is made of high-impact urethane and features a working flip-up visor, light-up repulsors, eyes and chest plate, and a shoulder mounted cannon that can fire bottle rockets. Le is currently working on a new version of the armor, with wrist mounted machine guns to round out his arsenal, and while he still has a lot of work to do on it, it's still probably the best looking costume I've ever seen.